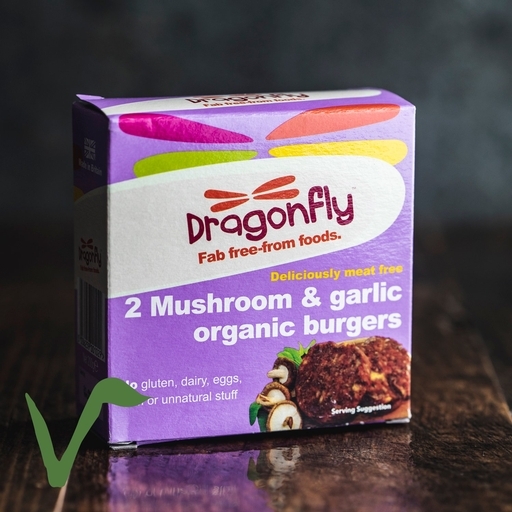 Savoury organic mushroom and garlic burgers made just down the road from our farm in Devon. These award-winning veggie burgers are packed with satisfying soya beans and brown rice, with flavoursome mushrooms, herbs and spices. Easy to cook and ready in minutes! Remove all packaging before cooking. There are lots of ways to cook them: barbecue for 6 mins on each side, grill for 5 mins on each side or fry for 3 mins each side. Oven bake at 190°C/Gas 5 for 15 mins, or microwave on full for 2 mins. Soya bean fibre and curd (45%), cooked brown rice (32.5%), onion, mushrooms (7%), sunflower seeds, tamari (water*, soya beans, salt*, alcohol), sunflower oil, corn flour, sea salt*, garlic (0.47%), mixed herbs, stabiliser guar gum, black pepper.